We were there during that time of year when spring and winter overlap – new snow was falling in the mountains but melting at the lower elevations, already causing the streams to run with clear, cold water. 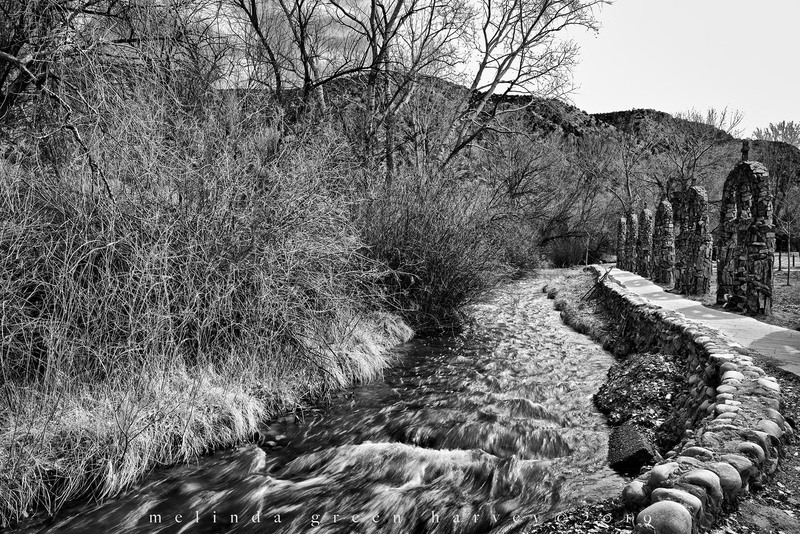 Posted on April 7, 2019, in Photography and tagged 365 photo project, black and white photography, chimayo, learning to see, Leica, melinda green harvey, monochrome, new mexico, one day one image, photo a day, photography, postaday, Protero Ditch, river, road trip, snowmelt, spring, stream, take time to look, thoughtful seeing, travel photography. Bookmark the permalink. 13 Comments. Nice!—a photograph I enjoyed looking at for a long time. Probably has something to do with your effective use of leading lines. Thanks for being so agreeable! Thanks, Karen! Good to see you here on the blog! Great photo, it is both moody and welcoming just like Spring! It’s the juxtaposition of structure on the right and wilderness on the left that gets me. That is an interesting sort of mash-up. The whole place is fascinating to me*, and I go there every time I am nearby. *You probably already noticed that. Yeah. I kind of did.